It is the home of the largest population of scarlet macaws in the country and it is also the home of almost 400 species of birds, 140 species of mammals and 116 species of amphibians and reptiles, as well as 600 species of insects. Six natural eco-systems have been identified in the park and it protects endangered species such as the jaguar, puma, crocodile, tapir, poison dart frogs and the Harpy eagle. The forest also holds a great amount of exotic and endemic plants and insects that provide valuable information to the scientific and medical research communities. 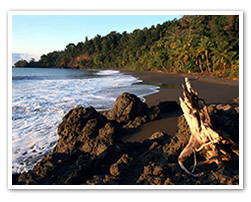 It is the best place to catch a glimpse of the diverse wildlife that exists in Costa Rica. The Corcovado Tour starts at around 6:30 am at the highway entrance to the hotel where you will be picked up in a minibus. Breakfast at Sierpe. A 1-hour and a half boat ride tour to San Pedrillo, the Corcovado park entrance. A 3 hour hike tour in the park with a professional guide. Lunch. Back to Sierpe and the hotel by 6:00 pm. 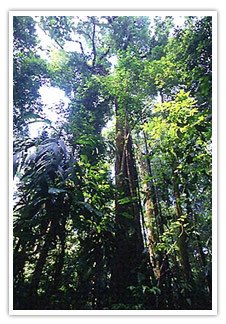 Our Ecolodge offers the best Corcovado National Park Tour for you!